This collection has been crafted to provide professional-sounding, easily prepared arrangements for busy pianists. 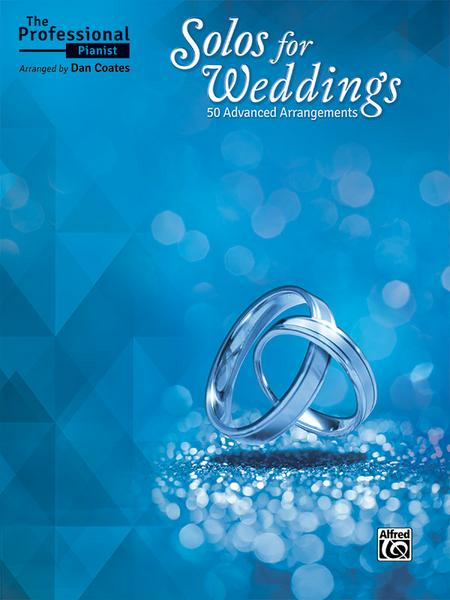 It contains 25 selections appropriate for wedding ceremonies, including favorites such as Pachelbel's "Canon in D" and Mendelssohn's "Wedding March" as well as timeless selections by Bach, Handel, Mozart, Schubert, Saint-Saens, and others. Also included are 25 selections appropriate for wedding receptions---standards such as "Fly Me to the Moon" and "Someone to Watch Over Me," pop hits such as Michael Buble's "Everything," and classic movie songs such as "A Dream Is a Wish Your Heart Makes" from Cinderella. Each arrangement has been carefully engraved for easy reading, and approximate performance times have been included to assist with planning. These piano solos will provide a valuable resource for any wedding pianist. 168 pages. Titles: Air (from Water Music) (Handel) * Air on the G String (Bach) * At Last * Ave Maria (Bach-Gounod) * Ave Maria (Schubert) * Ave Verum Corpus (Mozart) * Beauty and the Beast * Because You Loved Me * Bridal March (Wagner) * Can You Feel the Love Tonight? * Canon in D * A Dream Is a Wish Your Heart Makes * Embraceable You * Everything (Buble) * Fly Me to the Moon * Hero (Carey) * Home (Buble) * Hornpipe (Handel) * I Only Have Eyes for You * I Swear * I'm in the Mood for Love * It Had to Be You * Jesu, Joy of Man's Desiring * Largo (Handel) * Love Is Here to Stay * Make Someone Happy * Meditation (Massenet) * My Funny Valentine * The Notebook * Ode to Joy * Open Arms * Over the Rainbow * The Prayer * The Prince of Denmark's March (Clarke) * Rondeau (Mouret) * The Rose * Sheep May Safely Graze (Bach) * So This Is Love * Someone to Watch Over Me * The Swan * That's What Friends Are For * There You'll Be * They Can't Take That Away from Me * Trumpet Tune in D (Purcell) * Valentine * Wedding March (Mendelssohn) * When I Fall in Love * A Whole New World * Wind Beneath My Wings * You Raise Me Up. A great selection of not too difficult pieces. Clearly set out book.